The huge uptake of smartphones and tablets, coupled with ready access to fast mobile connections to the internet, has delivered a perfect storm of opportunities, but also challenges to the small business community in particular. Commenting in the last Solutions Review, Elizabeth O'Dowd said: "What makes an enterprise mobility solution even more important is the value it holds for the future of your enterprise. Computers are only becoming smaller; laptops are considered mobile devices to most of the top solutions, not just smartphones. "Sooner than you realise, mobile devices in the enterprise will be a necessity as the lifestyle of the workplace begins to change. Ignore this and not only will you have less efficient workers than your competitors, but employees will seek to work other places with more favourable and modern work environments." For your business, the age of the PC is well and truly over. The new era is more about collaboration, decentralisation and the further adoption of mobile devices as BYOD (Bring Your Own Device) accelerates. 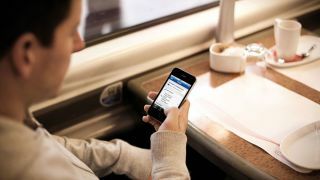 Indeed, Gartner believes next year will see half of all employers expecting their workforces to bring their own mobile devices to work. All businesses will need to develop their own Mobile Device Management (MDM) platform. In essence, these give your business the tools it needs to ensure mobile devices are used efficiently across your business in a completely secure environment. Commenting, Trent Fierro, director of security and software solutions marketing at Aruba, a Hewlett Packard Enterprise company, said: "Our advice to any enterprise is to address BYOD and mobility in phases. Determine where data loss can cause the most damage, which groups are most susceptible and how vulnerable the business is. "Don't expect BYOD to go away, so create a plan that defines user roles, roles for devices and what happens when rules are met and when they are not. Measure where user and IT benefits improve, as well as the organization's security posture and then move forward to solve the next use case." 1. Is the MDM platform neutral? This is important to ensure all operating systems are supported. In an ideal world all of your staff would use the same mobile devices from identical vendors, but in the real world you need to ensure your MDM can offer multi-OS management support. 2. Does the MDM support various configurations? Thanks to the advent of apps, every device that could be used across your business has a different profile. A good MDM should be able to take this into consideration and modify its protocols accordingly. 3. Is the MDM based on a legacy system? MDMs that have been specifically built to meet their purpose are preferable to an MDM that is a modification of an existing technology. This will ensure your MDM vendor understands your pressure points, is paying attention to the mobile ecosystem, and is developing their platform to cope with new technologies as they appear. The bottom line for all small business owners is that the use of mobile devices in their business is only going to expand. Developing an MDM service now ensures you can manage these devices securely today and into the future. Todd Carothers, executive VP of Product and Marketing, CounterPath told techradar pro: "Having worked with leaders in the MDM/EMM (Enterprise Mobility Management) market I find that there are two primary reasons businesses don't leverage these products. "The first is cost versus benefit, with businesses often reluctant to invest in a product or service because it doesn't see the immediate, palpable benefits. The second is the lack of perceived need, although this is slowly changing as we see a rise in security breaches and increased awareness as a result."